Join the Art Students League as we feature an exhibit that is a-head of its time! Showcasing work that is head, shoulders, knees and toes – and the full figure too. From massive to miniature, big and small, micro to macro, artwork comes in a multitude of shapes and sizes. This exhibit features a vast array of artwork in scale and size. Where else can you find pastel paintings by Lorenzo Chavez, Doug Dawson, Colleen Howe Bleinberger, Ramon Kelley, Richard McKinley, Elizabeth Mowry, Susan Ogilvie, Bob Rohm, Sally Strand, Duane Wakeham, and Albert Handell all in one place? These past judges and current from the Mile High International have accepted an invitation to show a painting in this year's gala event. This is a "Who’s Who" of celebrities in the national pastel painting world. The exhibit will feature approximately 100 pastel paintings selected by painter, author, and juror Albert Handell. American Farmhouse, 8" x 10"
Colorado attracts some of the best plein air artists from across the country with its inspiring scenery and wonderful climate. Plein Air Artists Colorado showcases this talent in the annual national juried show and sale, this year to be held at Abend Gallery in Denver, Colorado. The Opening Reception and Awards Presentation will be held on Saturday, August 9th, from 5 to 8pm. Award winners will be chosen by PAAC Master Signature Member Karen Vance. In 2013 more than $15,000 in cash and merchandise were awarded. Media sponsors included Southwest Art, Art of the West, American Art Collector and Plein Air Magazines. Getting paintings framed and ready to transport. One-woman show of mostly northwest Kansas scenes. Snow Melt in My Alley, 16" x 20"
Hay Bales in the Sun, 11" x 14"
Two of my paintings have been accepted in the National Paint America show. This show is America's foremost competition for American artists' representative paintings depicting any subject matter. The PaintAmerica Top100 is an annual juried competition and exhibition designed to showcase the finest emerging and established representative American painters. The top scoring paintings attain the honor of being recognized as part of the Top100 in the nation. With this honor comes national exposure, through an online and touring exhibition. A 2011 Paint America Top 100 Viewbook will be available and will include all Top 100 and Mini Top 50 paintings. See Paint America.org for more information. Wheat Stubble, 16" x 20"
I am one of the selected artists in the State of the Art / Kansas book. I will have four paintings including 'Wheat Stubble' in the book. 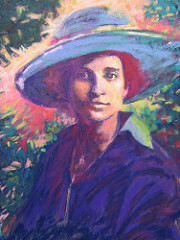 The show at Southwind Art Gallery; Topeka, Kansas runs from May- October 2011. The show then travels to Hays, Kansas and will be displayed at the Hays Art Center from June 15, 2012, through August 17, 2012 as the anchor exhibit for the Summer Hays Art Walk event. One of Shela Reilley's paintings depicts a downtown Colby building between Franklin and Lake Avenues. Former Colby resident Shela Reilley has four paintings featured in the Kansas 150 Art Competition, an exhibition and sale of Kansas- inspired artwork commemorating the state's 150th anniversary. The art show, held at the SouthWind Art Gallery in Topeka through Monday, Aug. 15 is a juried competition with cash prizes for first, second and third place. Reilley's artwork was chosen for exhibition by the jury, which included Neil Patterson, president of the Oil Painters of America, and Kristen Hoerth, editor-in-chief of Southwest Art Magazine. Reilley also had two paintings selected for the Mile High International Exhibition sponsored by the Pastel Society of Colorado. This collection of paintings showcases pastel artists from around the country. Richard McKinley, an award-winnning pastel artist, selected Reilley's work from more than 200 entries. Rocky Mountain National Park, 9" x 12"
This painting is at the Denver Art Students League Show. Winter Solitude, 11" x 14"
I have 5 paintings showing at the Gateway Show at the Aurora History Museum. Afternoon View, 8" x 10"
I am so happy to get two paintings juried into this show. Sponsored by the Colorado Pastel Society and displayed at the Curtis Arts and Humanities Center, Greenwood Village, Colorado.